Join us for the fourth installment of Spotlight Sessions! If you haven’t had the opportunity to attend, come find out what you’ve been missing! Casey has put together a SPECIAL WOMEN’S SINGER/SONGWRITER event for this go around. 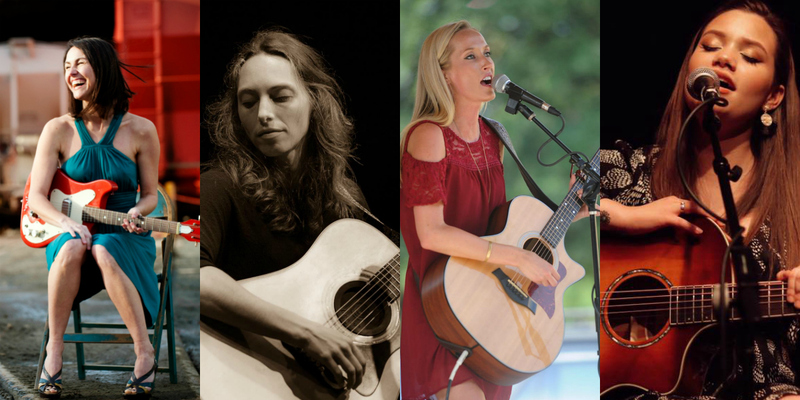 Joining her for this Nashville-style songwriter round and bringing their awesome talent to the stage are Martha Bassett, Abigail Dowd and Becca Rae!!! Join them as they share their songs and the stories behind them in this wonderfully intimate setting! Tickets are $10. NC sales tax is included in the ticket price. There is an additional $3.50 per ticket web fee for Internet purchases; call 336-333-2605 to avoid this charge. Guests may also opt to have their tickets mailed to them for a $1 post fee, or can pick up their tickets in will call for no additional charge. Martha Bassett is a West Virginia native, and a North Carolina artist. After earning a BM in voice at the University of Kentucky and a MM at the University of North Carolina at Greensboro, Martha has become a strong voice in the NC music scene, touring nationally and releasing 9 recordings to date. Her new disc, “Hot Pepper Queen,” will be out in May 2019. Martha has also contributed musical arrangements and vocal coaching to the films “Junebug” (Sony Classics 2005) and “Abundant Acreage Available” (2017). 2018 marked the beginning “The Martha Bassett Show,” a live monthly musical variety show hosting national artists, local talent, and Martha’s band. The show is released on “The Martha Bassett Show Podcast.” Season 2 is underway at the Reeves Theater in Elkin, NC. Abigail Dowd is a singer/songwriter/guitarist with a gift for telling stories. She grew up under the longleaf pines in the Sandhills region of North Carolina; land that could only be tamed by Scotch-Irish settlers. Dowd brings this heritage of storytelling and determination to her music and weaves together hints of Celtic melodies with the soulful gospel of the south. There are also strands of something haunting and mysterious, as unique as the journey she took to get to where she is now. Dowd comes from a long line of musicians and always knew music was her destination, and it shows. Every song is like an ethnography of the places she’s been and the people she’s met along the way. Dowd’s playing has been described by PopMatters as “Robust acoustic guitar and subtle tones of instrumentation that offer themselves well to the songs’ feelings of reflection, carried forward most ebulliently by [her] warm, sonorous vocals.” She combines her classical fingerpicking style with the edgy bass and percussion of Jason Duff to create a sound that dances between folk, rock, and blues. Her latest album, Not What I Seem, releases April 5, 2019. Her debut Album Don’t Wake Me was released in 2017. Becca Rae is an award-winning country music songwriter based out of Southern Pines, NC. She has released three independent original albums, which are available on iTunes, Spotify, Amazon Music, and all major online music outlets. Her debut record “Strength” was released in 2008, followed by “Somewhere in Georgia” in 2011 and “Live at The Sunrise” in 2018. She has opened in concert for country music legends like Loretta Lynn and Montgomery Gentry, and she has shared the stage with modern songwriters like Gary Hannan and Lacy Green. She also became the first local musician to headline a “First Friday” concert in Southern Pines. Becca Rae is the creator and host of the historic Sunrise Theater’s “Singer-Songwriters in the Round” showcase, a bi-annual event that highlights original music from North Carolina. Her work in the local music community has earned her the “Best of the Pines” award in both 2017 and 2018. Becca Rae’s songwriting features classic country melodies, powerhouse female vocals, and carefully crafted lyrics. Two of her original songs, “She Talks About L.A.” and “Stay in Bed” were featured on DirecTV’s “The Right Place with Kevin Sport”. She continues to actively pursue a career in songwriting through writing, recording, and performing her original music on stages all across the state. Casey Noel is a singer/songwriter in the NC Triad area. She is currently a senior at UNCG, and has been playing guitar since the age of five. Casey Noel brings a blend of folk, country, blues, and pop to her unique rasp and powerful sound. She possesses a pure vocal quality that is both distinct and mesmerizing. Though fairly new to the Triad music scene, she has become a crowd favorite at a variety of different venues throughout the Triad area. Her passion for singing and songwriting has her poised to make a big impact on the NC Triad music scene and beyond. Casey is the creator and host of Spotlight Sessions a Nashville style singer/songwriter event that takes place bi-monthly in The Crown at the Carolina Theater. Casey plans to release her first EP in the spring/summer of 2019 – so be on the lookout!